Oates’ false accusations in 1678 led to the execution of at least 15 innocent men. Although initially he found favour with Parliament, he was arrested in 1681 for sedition. In 1685, with James II on the throne he was retried and imprisoned for life for perjury, and to be whipped through the streets of London for five days a year. 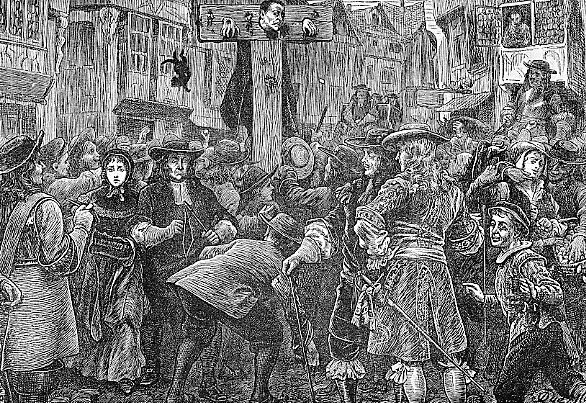 This is a contemporary engraving of Oates in the pillory prior to his being paraded through London. I was listening recently to an episode of the seven part chronicle of the Stuart dynasty on BBC Radio 4 written by radio dramatist Mike Walker, when Charles II (played by Pip Torrens) refers to Titus Oates as being a member of the Green Ribbon Club. Oates was the fabricator of the ‘Popish Plot’ in 1678, a supposed conspiracy by Catholic Jesuit priests to kill the king which caused a wave of anti-Catholic feeling to sweep across the nation. Following the death of Oliver Cromwell in 1658, the English parliament proclaimed Charles II to be king in 1660, the Restoration. Although Charles favoured a policy of religious tolerance, parliament enacted several laws designed to secure the dominance of the re-established Church of England. In 1672, Charles attempted to suspend all penal laws against Catholics and other religious dissenters, but Parliament opposed this and forced Charles to agree to laws that forced public officials to receive the sacrament prescribed by the Anglican church and to denounce certain teachings of the Catholic Church. The 1670s were beset by suspicion and accusation about the religious affiliation of individuals, and plotting and counter-plotting by political opponents, and it was during this decade, that the Green Ribbon Club came into being. The Green Ribbon Club was one of the earliest of the loosely combined associations which met from time to time in London taverns or coffee-houses for political purposes in the 17th century. The ‘Green Ribbon” was the badge of The Levellers in the English Civil Wars, a political movement which emphasised popular sovereignty, extended suffrage (voting rights), equality before the law, and religious tolerance. One of the taverns in which they met was The Rosemary Branch in Islington which got its name from the sprigs of rosemary that Levellers would wear in their hats as a sign of identification. The club was likely founded around 1675 and it met in the King’s Head tavern in Fleet Street in London, and was first known as the King’s Head Club. Many of its members had fought in the civil war and were hostile to the court of politicians holding power in London. They were in the habit of wearing a bow or bob of green ribbon in their hats which was used for mutual recognition in street brawls. About 1679, the name of the club was changed to the Green Ribbon Club. Anthony Ashley-Cooper, the 1st Earl of Shaftesbury, a prominent politician and one of the founders of the Whig Party which opposed an absolute monarchy, may have been the President of the Green Ribbon Club. Though Shaftesbury was one of twelve members of Parliament who invited Charles II to return to England, he later argued in favour of frequent parliaments and argued that the nation needed protection from the potential Roman Catholic successor to King Charles II, his brother and heir presumptive, James, Duke of York. James was suspected of being pro-French and of having designs on becoming an absolute monarch. The Green Ribbon Club actively promoted the Exclusion Bill which sought to exclude James from the thrones of England, Scotland and Ireland. The Tories were opposed to the bill and ‘Whig’ became a term of abuse for those who supported it. The fervent Tory Samuel Johnson often joked that ‘the first Whig was the Devil’. Though the bill was passed by Parliament in 1679, Charles II was forced to dissolve Parliament several times to prevent the bill coming into law. Ultimately however the succession was not altered, with James becoming king on the death of Charles II in 1685. The ‘Exclusion Crisis’ nevertheless contributed to the development of the English two-party system. This is a depiction by William Hogarth of a street celebration in 1653 outside the King’s Head tavern in Fleet Street applauding the dissolution of the Rump Parliament by Oliver Cromwell. 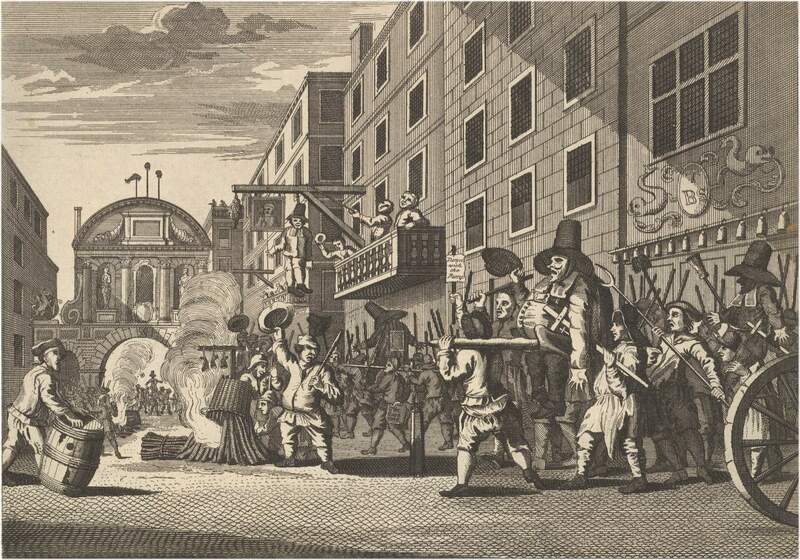 This possibly fictitious scene likely resembles the Green Ribbon Club’s pope-burning processions which took place outside the King’s Head tavern in 1680 and 1681. The Green Ribbon Club served both as a debating society and an intelligence network for the Whig faction spreading scandal and sedition throughout London. Bills under discussion in Parliament were debated by the members over their tobacco and ale, with the latest news from Westminster or the city brought in by an endless stream of supporters. The leader of the King’s government, Lord Danby, an opponent of all toleration, issued a proclamation, later withdrawn, for the suppression of coffee-houses because of the ‘defamation of His Majesty’s Government’ which took place in them. Who were the members of the club? In 1979, Thomas Dangerfield, another conspirator and perjurer like Titus Oates, supplied the King with a list of forty-eight members of the Green Ribbon Club. As well as Shaftesbury, it included the Duke of Monmouth (an illegitimate son of Charles II who later led the unsuccessful rebellion to depose his uncle, then James II) and statesmen like Halifax, Shaftesbury, Buckingham, Macclesfield, Cavendish, and Bedford; together with former Cromwellian supporters like Lord Falconbridge, John Claypole and Henry Ireton (two sons-in-law and a grandson of Thomas Cromwell); and various profligates and scoundrels of the type of Oates. The changing political allegiances at this time are difficult to follow. Political lobbying was to become as influential as patronage in Parliament. The Green Ribbon Club enabled Shaftesbury to construct the first systematised political organization in England. Malign motives were placed on all the actions of the government, especially at the time of forthcoming elections, and men’s characters were shaped so as to be chosen or rejected by the electorate. 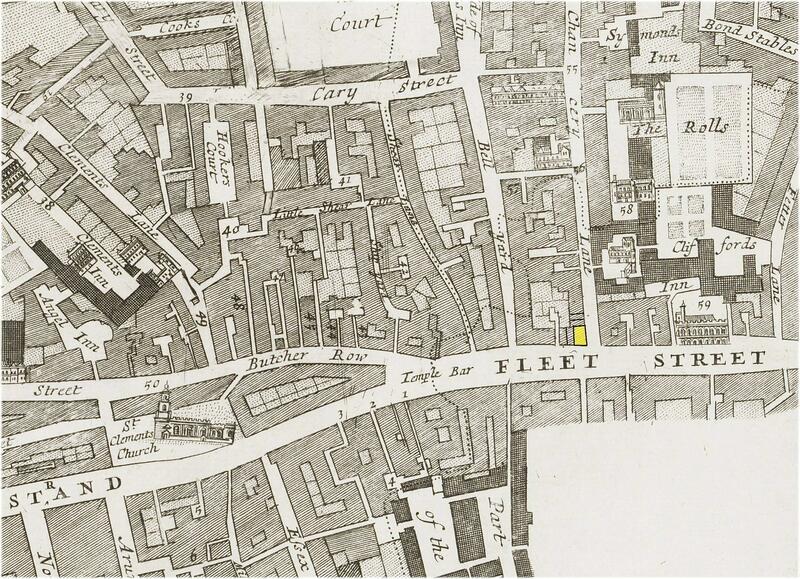 In the general elections in 1679, the Whig interest throughout the country was managed and controlled by a committee sitting at the club in Chancery Lane. The club was particularly effective in the agitation of the Petitioners who demanded that Charles II recall Parliament, showing all the skill and energy of a modern political party. The petitions were prepared in London and sent out to every part of the country, where paid canvassers took them from house to house collecting signatures with, it is said, an air of authority that made refusal difficult. The failure of the Exclusion Bill to become law however, was a blow to the Green Ribbon Club. In 1681, support for the Tories returned. Shaftesbury was arrested for high treason, though charges were dropped. Fearing another prosecution, Shaftesbury, and others who opposed the king, fled to Holland in 1682. The influence of the club was further damaged in 1683 by the Rye House Plot, a plan to assassinate King Charles II and his brother, James, when they passed a house near Hoddesdon in Hertfordshire on their way back from the horse racing at Newmarket. The plot, organised by a group convened by Robert West, a Green Ribbon Club member, was however uncovered. Twelve people were executed, and two dozen more were imprisoned or exiled. Some historians have suggested that the extent of the plot may have been exaggerated by Charles or his supporters to allow the removal of most of his prominent political opponents. Although the tavern was still in existence during much of the 18th century, the Green Ribbon Club which made it famous did not survive the accession of James II in 1685. Mike Walker’s chronicle of the Stuart dynasty in seven episodes was first broadcast on BBC Radio 4 in June and July 2013, and repeated in August 2014. Mike Walker has also written a chronicle of the Plantagenet monarchs in six episodes which were also broadcast on BBC Radio 4, in 2010 and 2011.